. yakimono 焼物 Pottery - Introduction . Everyone uses pottery in the daily life. Pots, Plates, Figurines, Decoration pieces ... and much more. Let us try and find some haiku with relation to these items. 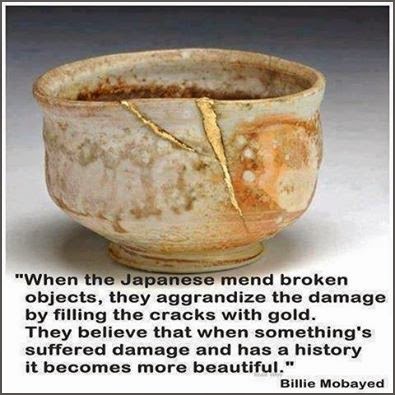 Check my Haiku and Pottery pages before you carry on. Banko Ware, a pottery art form with hundreds of years of history behind it, thriving in the port town of Yokkaichi, Mie Prefecture. Banko ware was first created by Nunami Rozan a wealthy merchant who lived in the mid 18th Century. 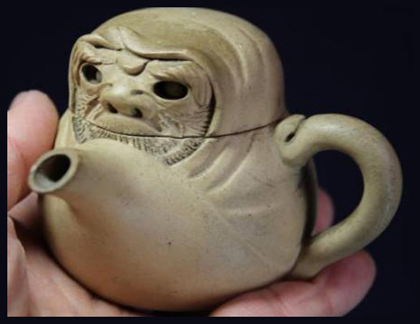 Like many wealthy people of the time, he developed a deep interest in the traditional Way of Tea. Rozan also dabbled in pottery, and the dark colored items he made for his own enjoyment soon caught the eye of other exponents of the Tea Ceremony, and so Banko ware was born. Rozan’s work was stamped with the words bakofueki, or “constant eternity”, in the hopes the pieces would be used and enjoyed well after his death. Interestingly enough, despite the popularity of Banko ware, it wasn’t until well after his death that the art form was revived and reached greater heights These days Banko ware teapots, tea cups, small sake ochoko cups and serving bottles, vases, plates and ornamental ware are in great demand from those with an eye for pottery, made all the rarer as there are just 22 government recognized Banko Master Craftsmen amongst the 1,300 potters working to preserve their art. Banko ware implements have long been favored among Tea Ceremony practitioners for their refined simplicity and because the oil from people's hands and tannin from the tea leaves gives Banko ware a beautiful sheen the more it is used. For that reason, specialists caution against scrubbing or washing with detergent. Another reason is due to its light weight. The body, spout, handle and lid are made as finely as possible, by means of thinly rolled clay being stretched over a wooden mold of several interlocking yet easily removable pieces. This unique process in Japanese pottery was developed during a resurgence in Banko ware popularity in the late Edo Period. 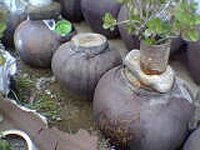 The characteristic dark, rusty color of Banko Ware is due to both the specially prepared iron-rich red clay and yellow clay blend, and due to the firing process. Low oxygen levels and incomplete combustion makes the kiln more akin an oven. The end result is color variation according to the kiln temperatures and amount of oxygen. Decorations are simple, and done while the clay is still wet. Often seen patterns include a pine bark like effect, a stamped floral effect and light carvings. Most are fired as is, but some pieces are partially glazed for a different feel and look. These pieces and the different styles employed can all be seen at the Banko Pottery Center in Yokkaichi, which exhibits and sells quality Banko ware as a representative craft of Mie Prefecture. There is a small studio on the first floor of the center offering fascinating one-day Banko art classes. Reservations are required in advance. To further your knowledge and appreciation, the Yokaichi City Commerce and Industry Division run “Banko Ware Factory Tour” is also recommended, taking in 13 factories and kilns where visitors can also try their hand at pottery making and painting at certain studios. 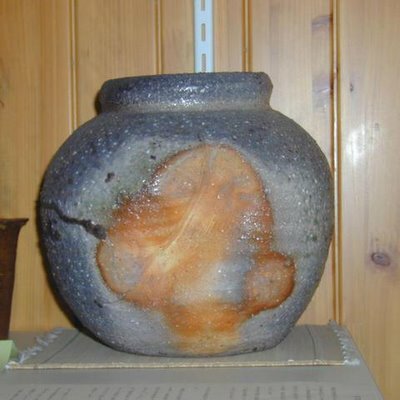 Every May, the Banko Pottery Center draws thousands to the two day Yokkaichi Pottery Fair, famous for it’s wide array of traditional and original Japanese pottery. It’s a great opportunity to meet the craftsmen, see the various styles available and get a bargain at the same time. The Nun Rengetsu (Rengetsuni 蓮月尼) scraffitoed her poetry onto her pottery. She didn't have a studio, wheel or kiln. She hand built her ware and fired in other potter's kilns.
. yakitsugiya, yakitsugi-ya 焼継屋 repairing broken pottery . In Edo and even now. "Basi" is wine made from sugarcane. The photo of the jars where they are stored in. freshly made, or you could sgraffito through underglazes. Lots of ways to go. I did a place setting for myself as the teacher's model and stamped it with haiku around the rim using a rubber stamp set with letters of the alphabet.
. Read about Seri Pottery from the Sonora. . I have been a Pottery student for a long time. My teacher has always wanted me to add my poetry. I have read about using an old heat zerox placing it on the pot and firing. I have never done it. I have carved anti violence poems and anti agent orange on burnished terra cotta with a marker. This is a Collectors' Help and Info Page for collectors of antique Chinese and Japanese porcelain with several thousand pages of information available without charge.